The Global Volcanism Program has no activity reports for West Eifel Volcanic Field. The Global Volcanism Program has no Weekly Reports available for West Eifel Volcanic Field. The Global Volcanism Program has no Bulletin Reports available for West Eifel Volcanic Field. The West Eifel volcanic field in the Rhineland district of western Germany SW of the city of Bonn is a dominantly Pleistocene group of 240 scoria cones, maars, and small stratovolcanoes covering an area of about 600 km2. It lies about 40 km SW of the smaller, but better known, East Eifel volcanic field. Individual vents, most of which cover a broad NW-SE-trending area extending about 50 km from the towns of Ormont on the NW to Bad Bertrich on the SE, were erupted above a mantle plume through Devonian sedimentary and metamorphic rocks. Scoria cones, about half of which have produced lava flows, form two-thirds of the volcanic centers, and about 30% are maars or tuff rings, many of which are occupied by lakes. About 230 eruptions have occurred during the past 730,000 years. The latest eruptions formed the Ulmener, Pulvermaar, and Strohn maars around the end of the Pleistocene and the beginning of the Holocene. This volcano is located within the Vulkaneifel, a UNESCO Global Geopark property. Buchel G, Lorenz V, 1982. Zum Alter des Maarvulkanismus der Westeifel. Neues Jahrb Geol Palaont Abh, 163: 1-22. Keyser M, Ritter J R R, Jordan M, 2002. 3D shear-wave velocity structure of the Eifel plume, Germany. Earth Planet Sci Lett, 203: 59-82. Mertes H, Schmincke H-U, 1983. Age distribution of volcanoes in the West-Eifel. Neues Jahrb Geol Palaont Monatsh, 166: 260-293. Ritter J R R, Jordan M, Christensen U R, Achauer U, 2000. A mantle plume below the Eifel volcanic fields, Germany. Earth Planet Sci Lett, 186: 7-14. Shaw C S J, 2004. The temporal evolution of three magmatic systems in the West Eifel volcanic field, Germany. J. Volcanol. Geotherm. Res., 131: 213-240. Zolitschka B, Negendank J F W, Lottermoser B G, 1995. Sedimentological proof and dating of the early Holocene volcanic eruption of Ulmener Maar (Vulkaneifel, Germany). Geol Rundschau, 84: 213-219. There is no Deformation History data available for West Eifel Volcanic Field. There is no Emissions History data available for West Eifel Volcanic Field. 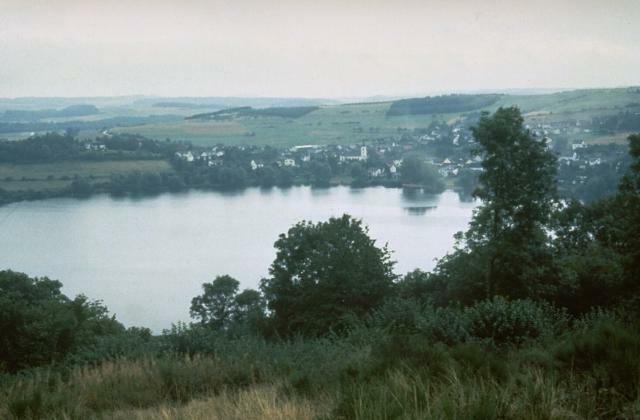 The lake-filled Weinfelder maar is one of about 80 maars of the West Eifel volcanic field in Germany, west of the Rhine River. The roughly 500-m-wide crater was formed during the late Pleistocene by explosions through nonvolcanic bedrock. About 230 eruptions during the past 730,000 years formed a 600 sq km area of maars, scoria cones, and small stratovolcanoes. Photo by Richard Waitt, 1990 (U.S. Geological Survey). 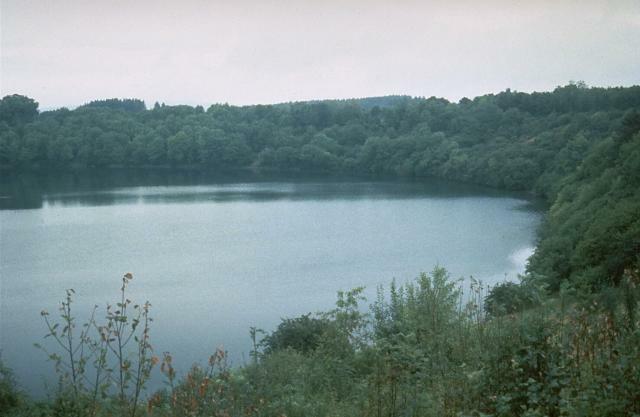 The Mehrener maar is one of about 80 maars of the West Eifel volcanic field. The village of Mehrener is located on the shore of a lake partially filling the crater, whose rim lies behind the village. Maars, scoria cones, and small stratovolcanoes cover an area of 600 sq km west of the Rhine River. Most originated during eruptions between about 730,000 and 10,000 years ago. The Global Volcanism Program has no maps available for West Eifel Volcanic Field. The following 412 samples associated with this volcano can be found in the Smithsonian's NMNH Department of Mineral Sciences collections, and may be availble for research (contact the Rock and Ore Collections Manager). Catalog number links will open a window with more information. Large Eruptions of West Eifel Volcanic Field Information about large Quaternary eruptions (VEI >= 4) is cataloged in the Large Magnitude Explosive Volcanic Eruptions (LaMEVE) database of the Volcano Global Risk Identification and Analysis Project (VOGRIPA).